Come and enjoy our friendly staff and atmosphere. We have a fully enclosed NON-Smoking area. I-35 Bingo was opened with you, the player in mind! 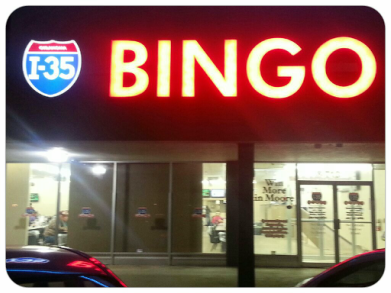 The stakes are high, but the buy-ins are low at I-35 Bingo. With a variety of games played daily, you are sure to have many hours of fun and excitement while playing bingo. We provide a spacious bingo hall that does cater to both, smokers and non-smokers alike. There is ample parking in front of the building that it is well lit, and we provide onsite security for your safety. 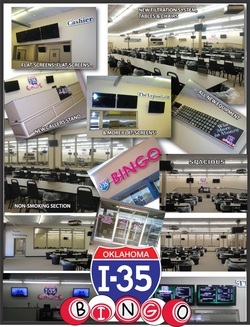 I-35 Bingo features state-of-the-art equipment, as well as, large flash boards ensuring that all players have a perfect view. In addition, we provide a full service kitchen that offers a variety of food and beverage choices to curve your cravings.